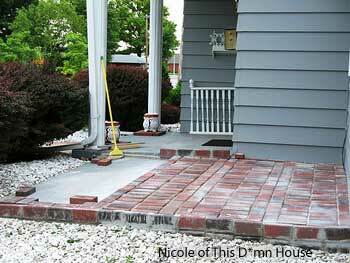 Add a brick floor to your porch and you'll be amazed at the results. Brick floors are not only stunning but also most durable. 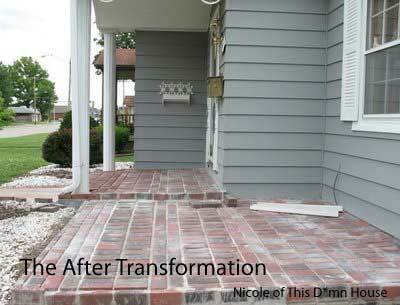 That's exactly what Nicole of This D*mn House, decided to do to her existing porch - and wait till you see her results! Not only did she lay brick decking over her existing porch floor but she also removed the old walkway and built a brand new brick paver walkway. 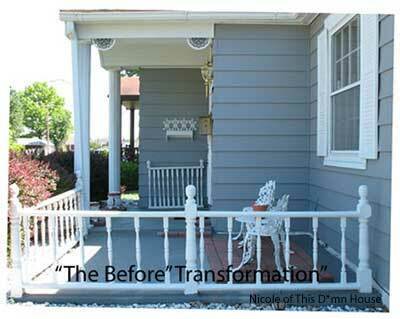 Thinking about doing the same to your porch? Nicole shows us how it's done. 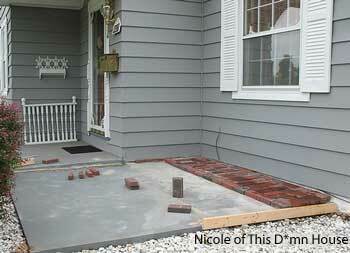 Nicole's mom always wanted a brick porch floor and after years of painting the concrete porch annually Nicole decided to see if she could create her vision. The porch surface was solid and, except for one spot, in structurally good shape. The existing concrete walkway, however, was not in such great shape and was another motivating factor for the renovation. Nicole writes: "I took my standard concrete porch and walkway and gave it an old-fashioned transformation using brick pavers. I put a layer (1/8 to 1/4-inch thick) of mortar mix below the bricks. I used a level to try and lay them straight and used my finger to imitate where the joint would be between them." "Once I got to the porch edge, I dug around the porch slab and put one layer of bricks below ground to a depth that let a second brick align with the existing slab height". As Nicole finished each row, she sprinkled a 60/40 mix (sand:concrete) into the joints and swept until the joints were filled. After doing a few rows, she'd mist them down with a hose. 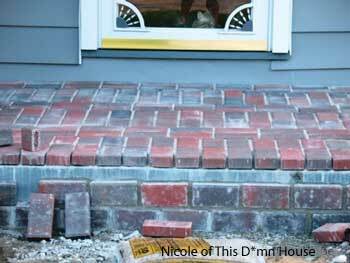 Nicole had been doing DIY projects for years but this was her first real experience with masonry to create a brick floor for a porch. 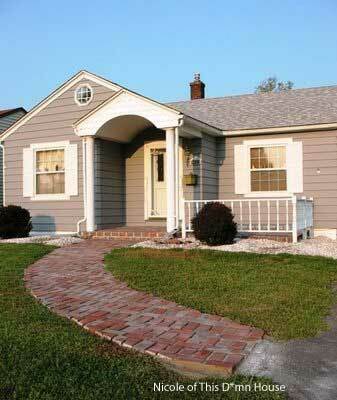 Brick floor sealer helps maintain original look of bricks and protects them from the elements. Brick sealers come in a variety of colors; however do not use a high sheen finish sealer if you want to maintain a natural look. Before applying a brick floor sealer, wash the brick thoroughly and allow to dry completely to prevent moisture from being trapped under the sealer which causes white spots. 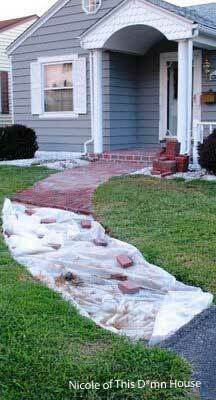 Nicole quickly discovered she couldn't finish the front of the porch or start the walkway without first removing a 30 foot-long, 22-30 inch wide, five-inch thick, curved sidewalk. After receiving a bid of $600 to remove it, Nicole, armed with a 14-pound sledge and pick-ax decided to do it herself in 100-degree heat! After much digging, laying sand, gravel, and bricks, she finally arrived at the edge of her driveway. 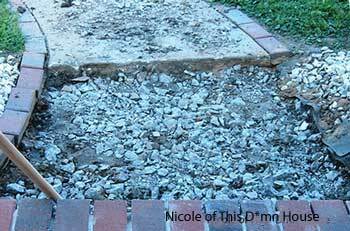 See how after hundreds of bricks (800-900 in all), about 1.5 tons of gravel, roughly 1,500 pounds of sand and about 600 pounds of mortar mix Nicole's project turned out! Not bad for her first brick and mortar DIY project. "It took all summer due to weather delays and an injury that delayed her for a few weeks", Nicole writes. Despite all the obstacles, it was worth it. The way it has changed the look of the house is amazing. The best part is that it looks like it has always been there." Nicole is a former journalist and now works in PR. She shares This D*mn House, a circa 1940 Cape Cod, with her mother, a Yorkie, and a cat. 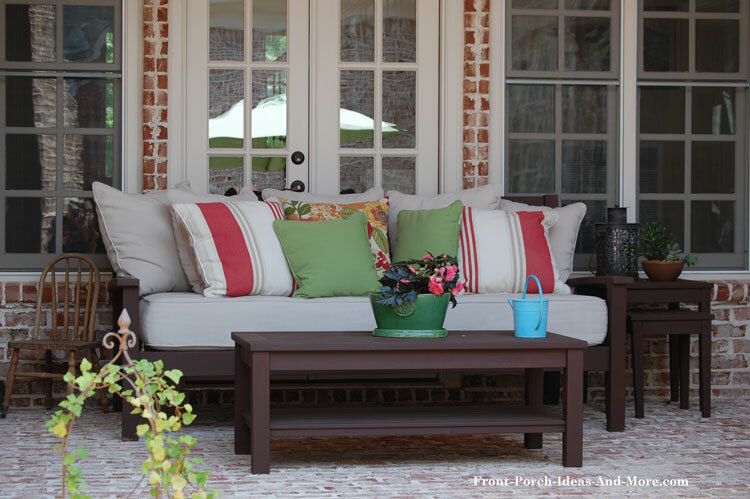 We really appreciate Nicole's sharing of her porch project with us and invite you to visit her blog.